The personification of countries or cities have been going on for centuries. Here's four goddesses from around 990 from a gospel drawing. They represent Sclavinia, Germania, Gallia, and Roma, bringing offerings to Emperor Otto III. In modern day, we mostly have goddesses supposedly representing the motherland in the astarte/venus/minerva style. Some have two. For instance, the UK has John Bull (created 1712) for England and Britannica as their goddess symbol. And of course the US had Columbia from the beginning and Uncle Sam, who came into use in......1812. A popular legend is that the name "Uncle Sam" was derived from Samuel Wilson, a meat-packer from Troy, New York who supplied rations for American soldiers during the War of 1812. There was a requirement at the time for contractors to stamp their name and where the rations came from onto the food they were sending. Wilson's packages were labeled "E.A – US." When someone asked what that stood for, a co-worker jokingly said, "Elbert Anderson [the contractor] and Uncle Sam," referring to Wilson, though the "US" actually stood for United States. BWHAHAHA! And again there are questions about the official narrative: Doubts have been raised as to the authenticity of this story, as the claim did not appear in print until 1842. Additionally, the earliest known mention definitely referring to the metaphorical Uncle Sam is from 1810, predating Wilson's contract with the government. The US Congress cleared this up by officially recognizing Uncle Sam Day on the birthday of Samuel Wilson in 1989. Except, Uncle Sam was not the original. Brother Jonathan was the first. 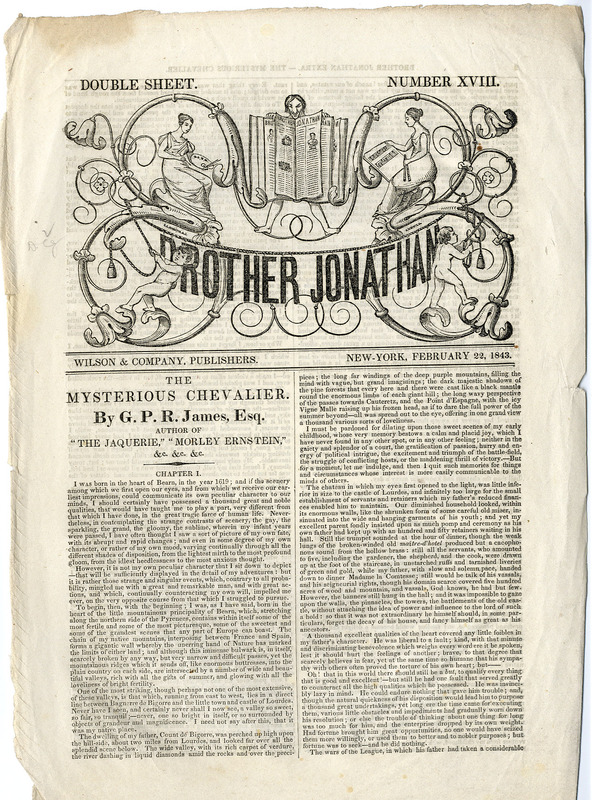 Brother Jonathan was usually depicted in editorial cartoons and patriotic posters outside New England as a long-winded New Englander who dressed in striped trousers, somber black coat, and stove-pipe hat. Inside New England, "Brother Jonathan" was depicted as an enterprising and active businessman who blithely boasted of Yankee conquests for the Universal Yankee Nation. After 1865, the garb of Brother Jonathan was emulated by Uncle Sam, a common personification of the continental government of the United States. They used both in advertising of course - for stimulants! As early as 1835, Brother Jonathan made a reference to Uncle Sam, implying that they symbolized different things: Brother Jonathan was the country itself, while Uncle Sam was the government and its power. Brother Jonathan has disappeared so I guess that we no longer have a country only the government and its power? That's how I am reading that! By the 1850's, the names Brother Jonathan and Uncle Sam were being used nearly interchangeably, to the point that images of what had previously been called "Brother Jonathan" were being called "Uncle Sam". Similarly, the appearance of both personifications varied wildly. For example, one depiction of Uncle Sam in 1860 showed him looking like Benjamin Franklin, while a contemporaneous depiction of Brother Jonathan looks more like the modern version of Uncle Sam, though without a goatee. We've seen this before, appropriate the devices of another symbol or figure and then getting rid of the original symbol. The New England-based Know Nothing Party, which Yankee Notions also lampooned, was divided into two camps—the moderate Jonathans and the radical Sams. Eventually, Uncle Sam came to replace Brother Jonathan, and the victors applied "Yankee" to all of the country by the end of the century, after the "Yankee" section had won the American Civil War. So when did we really put Jonathon aside, I think the evil PTB did it in one of their messed up symbolic cermonies with the sinking of the steamer, Brother Jonathan on July 30,1865. Of the 244 passengers and crew, 225 were believed to have died. The steamer was also carrying a large shipment of gold. Like the Titanic, so may people died because of lifeboats ---Although there were enough lifeboats to hold all of the people on board, only three boats were able to be deployed. Acts of courage and desperation, fear and self-sacrifice, were numerous. The rough waves capsized the first lifeboat that was lowered and smashed the second against the vessel's sides. Only a single surfboat, holding eleven crew members, five women, and three children, managed to escape the wreck and make it safely to Crescent City. Who were here important passengers that were lost because we know the PTB like to sacrifice people when they need a ceremony. Roseanna Keenan, a San Francisco Madam and her 7 soiled doves (muses, whatever). General George Wright was an American soldier who served in the Mexican–American War and the American Civil War . When the regular army reorganized in 1865 and created the Military Division of the Pacific, Wright commanded the District of California for a few months until he was given command of the newly created Department of the Columbia. He also was instrumental in several battles against the natives of the northwest. Did they create the Dept of Columbia for him to head so he would be a sacrifice for her? Hmmmm. Henry’s untimely death deprived historians of his insights into Mr. Lincoln. An attempt by an early biographer to get information was rebuffed. Historian Allen Guelzo noted: “Anson Henry flatly refused to share anything with [Josiah] Holland until he had ‘the approbation & approval of the family of Mr. Lincoln. '” With Henry’s death also disappeared the “many letters” from Mr. Lincoln that Henry said he retained. The reef the ship slammed into is now known as Jonathan Rock, and the St. George Reef Lighthouse was built in response to this disaster. A memorial for the deceased, registered as California Historical Landmark No. 541, sits at Brother Jonathan Vista Point in Crescent City. The shipwreck is listed in the National Register of Historic Places. Like most things they are involved in, they protect the landmarks so we cannot investigate further. Despite the gold coins (DOUBLE EAGLES) already discovered and brought up, crates of gold from Brother Jonathan still remain hidden and undisturbed. The large safe with its millions of dollars of jewels, gold bars, and gold was never found. The salvors estimate that four-fifths of the treasure is still waiting to be discovered—mere miles from land. This money was payment to the Native Americans in the Northwest to compensate them for lands and treaties. I am sure the government sent out a new payment to replace this one. RIP BROTHER JONATHAN, SYMBOL OF OUR COUNTRY AND THE PEOPLE. For now we are left with Uncle Sam, the symbol of government and its authority and power. Lady Brittanica appears to be a giantess with a pet lion. That's pretty awesome, actually. Anyone else remember Uncle Sam with a red-and-white striped hat? Not just modern depictions, but older ones, too. Anyway, this a great article, I never paid much attention to the origin story of this character. Also, there's Scandinavia and the World, a great comic strip where all the characters are countries. What would 'native' americans need gold, silver and jewels for? The sinking of the ship tale has the same holes in it as Titanic 'sinking'. 'Elite people' who had fallen foul of 'the elite' stupid enough to gather on one boat that gets 'sunk' in a collision with a natural object, not another vessel. NO third party witnesses! Most of those on board are 'killed' in the sinking. Both events are given markers, the rock and the iceberg, to fix them in 'time'. Odd that Brittania wields the trident, like so many other “mythical Gods” from around the plane-t? I smell Tartar Sauce! I also found it suspicious that the gold was never found. Was it ever even loaded? I know if I was going to sink a ship, I would just pretend the gold was loaded. They found all sorts of jewels and other debris but only a few "DOUBLE EAGLES". The weather was really bad on the first leg of the journey and yet they still headed out into bad weather for the next leg of their trip. Then the Captain turns the boat around because of the weather and they hit the rock on their way back into harbor. Incredible isn't it when you realise that the 'cargo' this ship was said to be carrying is taken into consideration. Then we get told this; the rock becomes an 'uncharted reef' and it was overloaded. She been sailing the route for six years so one would think her captain and crew would know the waters, in all weathers, well. On July 30, 1865, the S.S. Brother Jonathan — dangerously overloaded with livestock, heavy equipment, and even a fire engine — crashed into an uncharted reef in the midst of a terrible storm. Perhaps in response to terrified passengers or to just a reasonable fear of storm surge, the captain had turned the ship around, intending to return to safety. However, the impact of the reef dealt a mortal blow, and Brother Jonathan sank quickly. Only 19 survived, making it the deadliest passenger shipwreck of the West Coast to date, and prompting the building of St. George Reef Lighthouse, the costliest and most remote lighthouse in U.S. history. The Brother Jonathan was a 220-foot paddlewheel-driven steamer built in 1851 in New York and owned for some time by Cornelius Vanderbilt. So not just 'another paddle steamer'. Vanderbilt, San Francisco, Gold, Symbolism of the States and a third take on what sunk her. On the way back, a particularly lusty wave picked the Brother Jonathan up high, and the following trough spitted the ship on an underwater granite spire. It began to sink immediately. Just where the truth lies in this tale is hard to fathom. I am wondering how common an “Underwater granite spire” is? Another obelisk buried under the ocean? Lost Mu continent? Atlantis? And this version of Brother Johnathon I can make neither head nor tail of. He appears to be naked behind the spreadsheet although he looks nothing like the one in the op.